The explosives industry is currently made up of nearly 10,000 federal explosives licensees and permittees working in two major areas: commercial explosives and fireworks. ATF’s jurisdiction over explosives extends to requiring licenses to engage in the business of importing, manufacturing and/or distributing explosives materials. ATF protects the public from unsafe or unsecure storage of explosive materials and inspects the explosives storage magazines and records of explosives licensees and permittees on a regular basis to ensure compliance with federal explosives regulations. Due to the potential misuse of these explosive materials to the detriment of public safety, the role of the Bureau of Alcohol, Tobacco, Firearms and Explosives (ATF) in protecting the public from unsafe or unsecure storage is vital. ATF’s jurisdiction over explosives extends to requiring licenses to engage in the business of importing, manufacturing and/or distributing explosives materials. An ATF permit is also required to ship, transport or receive explosives. ATF regularly inspects the explosives storage magazines and records of explosives licensees and permittees to ensure compliance with federal explosives regulations. For exemptions from the federal explosives laws, see 18 U.S.C. § 845. The oldest type of explosive material known is black powder. While previously used for gunpowder, in the 1600s black powder was used in mining and rock blasting for road construction. Two centuries later, the development of nitroglycerin and dynamite led to advancements such as the construction of road tunnels and the invention of the seismometer to detect ground vibrations by earthquakes. In 2015, the latest date for which statistics are available, the U.S. used slightly less than 4.5 billion pounds of explosives. 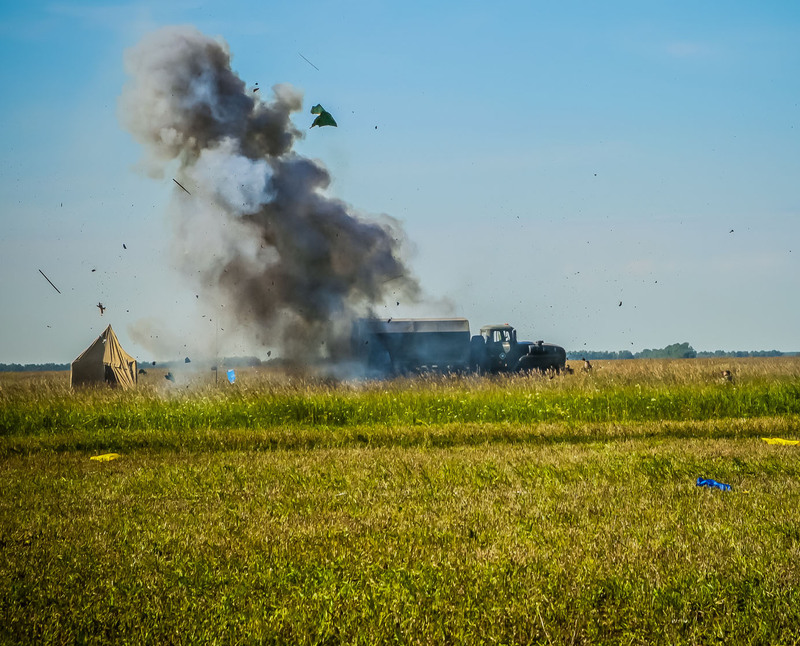 The explosives industry is currently made up of nearly 10,000 federal explosives licensees and permittees working in two major areas, commercial explosives and fireworks. U.S. Department of Transportation (DOT) – Jurisdiction over hazardous materials (including explosives) while they are in transit, whether by rail, water, motor carrier, air or other conventional means. U.S. Coast Guard (USCG) – Jurisdiction over explosives while they are in transit on any navigable waterways within the U.S. or within U.S. territorial limits on the high seas. Mine Safety and Health Administration (MSHA) – Jurisdiction over activities, including the use of explosives at mining sites, both above and below ground, for coal and other metal/non-metal mining. U.S. Department of Labor, Occupational Safety & Health Administration (OSHA) – Jurisdiction over worker safety on the job, including the use of explosives at job sites, or while under manufacture or other processing of the explosive materials. U.S. Department of Defense (DoD) – Jurisdiction over explosives when they are used by the military, or on behalf of the military pursuant to a contract between an explosives supplier and any of the various military departments of the U.S.
Consumer Product Safety Commission (CPSC) – Regulates consumer fireworks, which are fireworks not subject to ATF control under 27 C.F.R., Part 555, the Federal Explosives Regulations. CPSC is also concerned with the distribution, possession and use of illegal fireworks. U.S. Department of Homeland Security (DHS) – Chemical Facility Anti-Terrorism Standards (CFATS) program identifies and regulates high-risk chemical facilities to ensure they have security measures in place to reduce the risks associated with these chemicals. ATF is charged with enforcing the federal explosives and arson laws, which include the National Firearms Act (codified at Title 26, United States Code, Chapter 53); the Organized Crime Control Act of 1970, Title XI; and the Safe Explosives Act of 2002 (codified at Title 18, United States Code, Chapter 40); and the implementing regulations (codified at Title 27, Code of Federal Regulations, Parts 479 and 555).